The High School address of 64 Holden Street is a little misleading -- see the map below. Holden Street bears off to the left at the bottom of the hill on which Shrewsbury HS is located. The HS is actually on the street labeled "Cypress Ave" (on Google Maps), at the top of the hill. As the map indicates, after turning off Main St. onto Holden St., you must proceed straight through two intersections and continue up the hill to get to the High School. 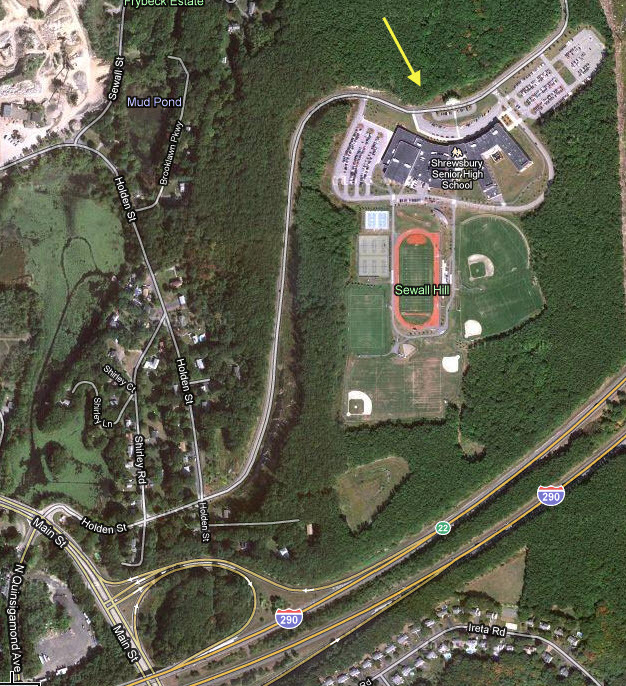 Please see the map and aerial photo below for the location of the High School. * Follow Route 128 North to Mass Pike West to Exit 11A (Route 495). * Proceed on Route 495 North to Route 290 West. * Take Exit 22, Main Street Shrewsbury. Bear right off the exit ramp to the traffic light. * Turn right onto Holden Street. * Proceed straight through two intersections to the high school at the top of the hill. * Follow Route 495 South to Route 290 West. * Follow the Mass Pike to Exit 10, Worcester 290 East. * Continue on 290 East to Exit 22, Main Street Shrewsbury. Turn left at the end of the exit ramp onto Main Street. 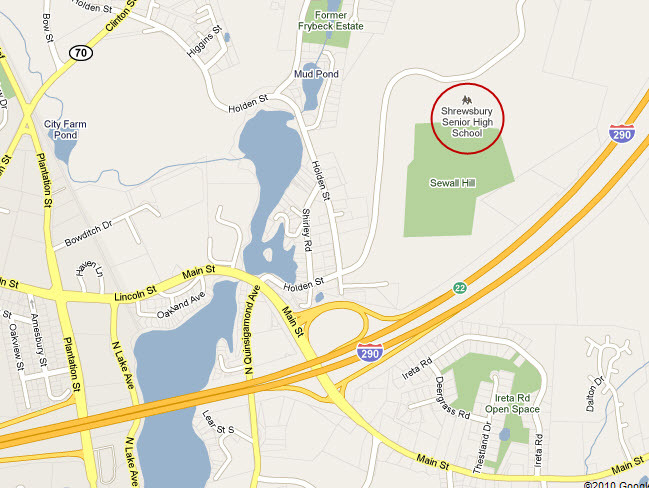 * Follow Route 2 to 190 South to Exit 10, 290 East Worcester.